Here’s something we’d like to see more of: Nintendo is letting an independent developer do something cool and weird with two of its most iconic characters. 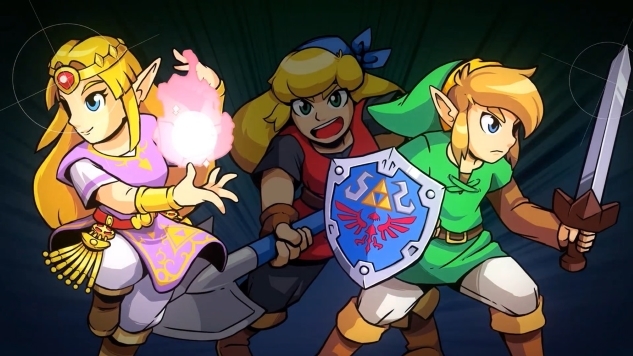 Cadence of Hyrule, which is coming to the Switch this spring, is a mash-up of Brace Yourself Games’ independent hit Crypt of the NecroDancer and a little game series known as The Legend of Zelda. Like the original NecroDancer, it’s an action game that combines the randomization of a roguelike with the beat-centric interaction of a rhythm game, only with characters, items and music from the long history of Zelda games. You’ll be able to play as Cadence, the original hero of NecroDancer, or as her new friends, Link and Zelda. If it plays just like NecroDancer, you can’t just go blasting through Hyrule, though, slicing up Moblins and Dodongos at will. You’ll have to move and attack to the beat of the music, both to actually inflict any damage, and also to keep your score multiplier going. As an officially sanctioned Zelda spin-off, that music will be pretty familiar to anybody who’s played Nintendo’s adventure series over the last, oh, 33 years, with new chiptune remixes of 25 pieces of Zelda music. Although this kind of crossover is unexpected, it does make a lot of sense. Like many recent independent games, NecroDancer bore a strong Zelda influence, with a top-down perspective pulled right from the earliest Zelda games. Brace Yourself essentially created a spiritual successor to Zelda built around that major new idea of rhythm-based combat. Now they’ll get to explore that concept again, but using the world-famous characters and concepts they were riffing on all along. Hopefully this leads to greater cooperation between Nintendo and talented studios that have proven they can make great games. Nintendo doesn’t develop every game using its major characters—several Mario and Zelda spinoffs have been made by other studios working under Nintendo’s guidance, but they’re almost always Japanese developers that Nintendo has a history with. It’s very unusual for a studio like Brace Yourself, which is relatively small and based in Vancouver, to get to play around with Nintendo’s biggest properties. That kind of cooperation can breathe new life into a series as venerable as Zelda, or at least lead to fascinating little detours that cast a familiar favorite in a new light. Cadence of Hyrule: Crypt of the NecroDancer feat. The Legend of Zelda was announced today in a Nintendo Direct devoted to independent games coming to the Switch. We don’t have a firm release date, but Nintendo’s saying it’ll be out at some point during the spring of 2019. If you want a brief glimpse at Zelda and Link ankles deep in some NecroDancer-y action, check out the video below.